Toni Williams has been a professional artist and muralist for over 20 years. 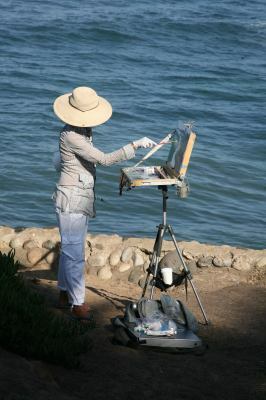 She is a member of the Rancho Santa Fe Art Guild, San Dieguito Art Guild, Oil Painters of America, California Art Club and the American Impressionists Society, Signature Member. A native of New York, Toni moved to San Diego in 1972 to finish her education at UCSD in La Jolla with a Bachelor’s Degree in Visual Arts. Taken with the arid and temperate climate of Southern California, Toni’s work has been influenced by the great plein air artists in the San Diego Area at the turn of the century, namely Maurice Braun, Charles Fries, Franz Bischoff and William Wendt. In the pursuit of gaining experience in painting the human form, Toni has studied under the tutelage of friend and mentor, Marileigh Schulte. She has attended workshops with Ray Roberts, Peggi Kroll-Roberts, Pat Kelly, Calvin Liang, Mark Kerckhoff and Greg Carter and recently Tom Balderas.